There are 3 ferry routes operating between Uruguay and Argentina offering you combined total of 92 sailings per week. Buquebus operates 3 routes, Montevideo to Buenos Aires runs 13 times per week, Colonia del Sacramento to Buenos Aires about 3 times daily & Punta del Este to Buenos Aires about 9 times weekly. Colonia Express operates 3 routes, Montevideo to Buenos Aires runs 3 times per day, Colonia del Sacramento to Buenos Aires about 3 times daily & Punta del Este (via Colonia) to Buenos Aires about 7 times weekly. As the frequency and duration of crossings on some routes varies we would advise that you do a live search for crossings from Uruguay to Argentina to get the most up to date information. Uruguay is a small country in South America, lying between Argentina to the west and Brazil to the north. 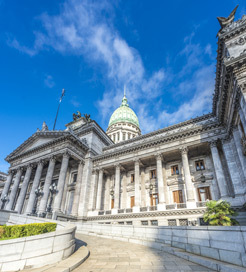 It ranks first in Latin America for democracy, peace and press freedom, boasting a beautiful landscape to rival its popular neighbours as well. It’s fast becoming a popular holiday destination, too, thanks to its diverse terrain and a huge choice of activities on offer. A typical day may involve relaxing in hot springs, spotting wildlife along the coast, horseback riding through vast plains or partying in vibrant beach towns. The capital, Montevideo is an exciting cosmopolitan city, with everything from superb beaches and trendy arts scene to large shopping malls and picturesque neoclassical architecture. 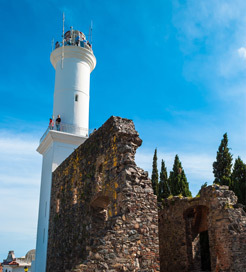 Uruguay has ports in Colonia del Sacramento and in the capital on the south coast, offering frequent sailings across the Rio de La Plata to Buenos Aires. With many high-speed crossings to choose from, Uruguay a useful departure point for Argentina. Argentina is a large country in South America, home to both the continent’s highest and lowest points. The inhabitants of the eighth largest nation on the planet are well-known for their gaucho culture, passion for football and superb beef steaks, whilst the land itself boasts some of the highest Andes peaks, magnificent glaciers in Patagonia and the spectacular Iguazu Falls. Buenos Aires is the lively capital, home to around three million locals known as ‘people from the port’. Often compared to a European city due to its eclectic mix of cuisine and Spanish-style city streets, Buenos Aires is also where the Tango dance was conceived, arguably Argentina’s most famous contribution to the rest of the world. Travelling by ferry is an easy way to hop across the border from Uruguay, as there are frequent high-speed routes on offer to Buenos Aires, with some crossings lasting just over an hour.